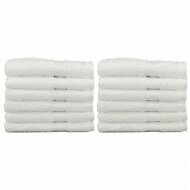 Bleach Resistant washcloth towels size 13X13 Premium-Plus quality at very competitive low price from Towel Super Center. These towels a and are excellent for hair salons and other businesses looking for color safe towels. Washcloths are the MVP for many businesses — the most versatile player. Many industries use them for a wide number of things. At salons, they help wipe up spills, cover tables during manicures and wipe off tools after haircuts. Gyms provide them to patrons to clean up after a tough workout or wipe down machines after use. In a restaurant, they float around the kitchen for taking care of spills, shielding hands from hot handles and wiping off sweat from cooks’ foreheads in a steamy environment. When you rely on washcloths for all these tough tasks, you also have to commit to giving them a deep cleaning. You need to be able to toss bleach in with these face towels to get them the thorough cleansing they need to remove bacteria and other grime. That’s why we made our bleach-resistant washcloths. These washcloths have been manufactured with durability in mind. 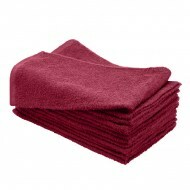 We know you will use our face towels for dozens of tasks per week. You need to feel confident you can launder them over and over again, without any appreciable decline in their function. You still need them to look fluffy and plush when they come out of yet another wash cycle. We focus on using sturdy cotton that resists bleach to give the washcloths a long lifespan. 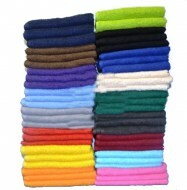 Our towels come in a slew of colors, so you can choose which one best suits your needs. If you are buying them for personal use in your home, you may want a fun color such as burgundy or navy blue to play off the color scheme in your bathroom. Business owners may prefer a solid black. Whatever your preference, we have one that will meet your needs. Hemmed on all four sides, these Bleach Safe Face towels are specifically designed for clients in search of a towel that will retain its color after washing in bleach. 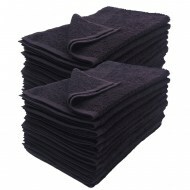 These towels are 100% cotton, very popular with Hair salons, Spas, Nail Salons. These particular face towels come in size of 13X13 and available colors are Black, Brown, Burgundy, Navy Blue and Charcoal. These washcloths are Super soft and Supreme quality. 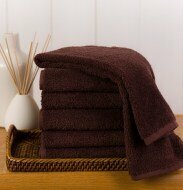 You can compare prices of our bleach safe towels with any competitors. We are right there with best prices and quality. You can save money by ordering our bleach-safe face towels in bulk. We offer discounts over retail price, and the more you purchase, the more you’ll save. Stock up so you can provide them to your workers, whatever they need them for. Contact us to discuss pricing or get more information on our washcloths.